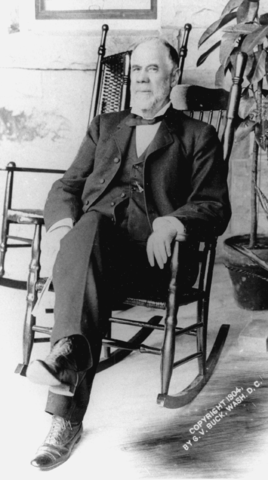 Politician and industrialist Henry Gassaway Davis died on March 11, 1916, at age 92. As a young man, he’d been a brakeman on the Baltimore and Ohio Railroad. He invested his savings and his wife’s inheritance in cheap, undeveloped land in what is now West Virginia. The timber and coal resources on that land eventually made Davis one of the state’s richest men. Realizing that political power could lead to even more wealth, he ran successfully for the legislature, serving first in the House of Delegates and then in the state senate. In 1870, he helped lead the Democratic Party to power in West Virginia. Legislators repaid the favor by electing him to the U.S. Senate, where he served two terms, occasionally backing legislation that benefitted him financially. In 1904, he was named the Democratic candidate for vice president. But, Davis and his running mate lost the election badly. At age 80, he was the oldest presidential or vice presidential candidate ever nominated by a major party. He is also remembered for his philanthropy—in particular, giving money and land to establish Davis and Elkins College.